Team Evotri: John Paul Interviews Hillary Biscay! John Paul Interviews Hillary Biscay! Hillary Biscay is an Ironman Champion (she took out Ironman Wisconsin ’08, which was your friendly neighborhood author’s first Ironman). 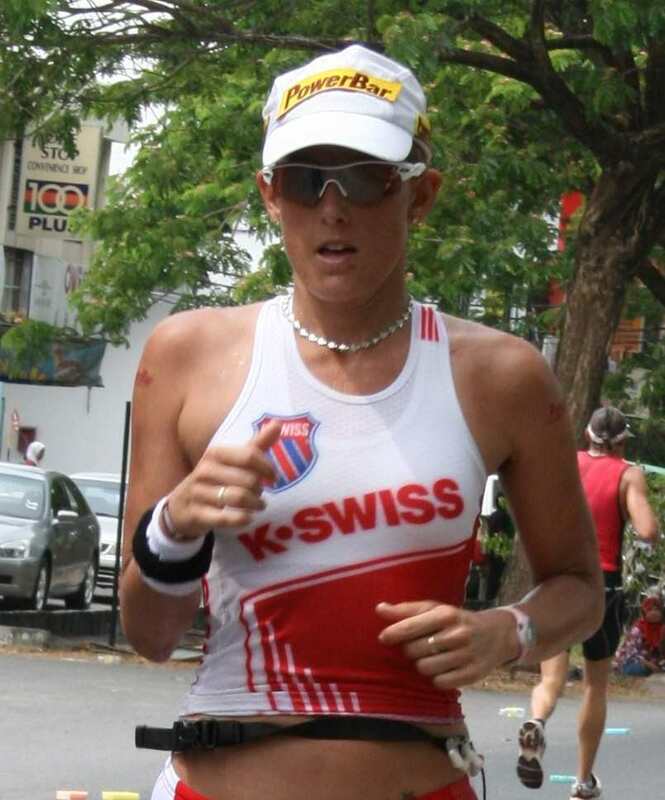 She is a perennial Ironman podium finisher and has now finished 40 Ironmans. She is an absolute glutton for punishment and WTC seemingly cannot offer enough races for her. Let’s catch up with Ms. Biscay from her palatial estate in Tuscon. JP: Hillary, what did you do for training today? HB: I started the day by hitting the road with two of my favorite girls: my neighbor, Sam McGlone, and another stud pro ironwoman, Tara Norton, who has been staying with me here in Tucson. Sam had some pre-race cycling intervals to do, so we did those with her, and then added some miles to make for a 2.5-hour ride (46 miles). My legs were pretty shelled before this ride even started, and it took everything I had to match Sam’s pace! I was so thankful for my girls’ company for making me push through it. Then an hour later we were in the pool. I just had a cruisey swim on the schedule, so I actually got to pace Sam for some race-pace stuff; that was a fun change of pace since she regularly rips my legs off on the bike! My swim was just 4,000 yards today. In the afternoon I completely passed out in my bed and then had to consume a huge quantity of coffee and chocolate to get moving again. Eventually I ended up on the treadmill at my gym—and even convinced Tara to join me—for a 93-minute hill session. Afterwards she accused me of trying to kill her. Which of course meant she loved it. JP: What has your training been like to give you the ability to race multiple ironmans every year? HB: I think I have trained myself to a level of fitness in which racing an ironman just doesn’t take the toll on my body that it once did. I am able to recover quite quickly, but this recovery requires a whole lot of months and years of training in the bank, and then doing the first ironman of a set (two or three in very close proximity) without much rest at all. That sometimes hurts, but I know that I can still usually record a solid finish at the first one, and then will feel even stronger the following week. JP: Your Ironman Wisconsin win was seen as a breakthrough, but you were right there and had placed second the two previous years. Compare the win with the two second places in terms of the day and what took you to the top. HB: By the time I arrived in Madison in 2008, I had logged five second-place iron-distance finishes in two years. Needless to say, ever since I led the race in ‘06 through mile 90 of the bike and then finished just five minutes out of first, I had been dreaming of winning Ironman Wisconsin. I was pretty determined that ‘08 was my year, and everything went according to plan on the day until I got passed about mile 21 on the run after leading from the start. I tried to challenge the woman who passed me (Karin Gerber)—to go with her—and I couldn’t. I spent about a mile feeling demoralized and then got my act together, remembering that anything could still happen, even though she eventually got about two minutes up the road from me. I kept my eyes glued on the lead bike next to her and around mile 23.5, found something inside myself that I didn’t know I had. As in, I thought I was giving my run that all, but I found another gear, and it was like I was magnetically pulling Karin back towards me. I was able to pass her back at the mile 25 marker, but honestly, this had taken so much effort that I didn’t know if I would make it to the finish. This final stretch was mostly uphill and I pretty much couldn’t even allow myself to celebrate til I hit the finish tape in first. It was amazing how surreal it all was, especially given how many times I had imagined this moment! JP: After Ironman Wisconsin ’08, I threw up a ton and blacked out to celebrate. How did you celebrate after that race? HB: Haaa wow that is impressive! Pushing myself to the point of vomiting on the finish line has always been a goal of mine! I have yet to do it—only during the race, which I would imagine isn’t quite as fun. I celebrated my win much in the way that I celebrate every ironman finish, which is to return to the finish line and cheer in the last couple hours of finishers. I love the finish line in the final hours! Only this time was extra special because I was able to stand in the finish chute with my dear friend and Co-Champion Chris McDonald and be introduced as an Ironman Champion for the first time. How do you take your coffee: increasingly more black every month it seems! JP: When did you decide you would pursue triathlon as a career? HB: After my first pro race, Ironman Florida 2004, I decided it was time to put everything on the line and give a triathlon career a try. I had just come back from a broken hip and major surgery earlier that year and was able to finish right in the middle of the pro field. But I was also mid-way through a really intense English PhD program at the University of Southern California and knew I was compromising both my academic and athletic pursuits by trying to do both; there really wasn’t time for things like sleep! I didn’t ever want to look back and wonder what I could have done as a professional athlete. It was a fantastic opportunity but also a huge risk; I loved my studies and teaching at the university and was not pleased to give them up. I suppose there was also the chance—likelihood, actually, according to the odds—that I wouldn’t “make it” as a pro. But I guess I didn’t waste a lot of time worrying about that. I just went for it, and I have been very fortunate not to have had to look back. JP: It’s probably safe to say that Brett Sutton was instrumental in your rise through the ranks. When did you start working with him and could you describe what life was like at team TBB? HB: He absolutely was. I am forever indebted to Brett for teaching me how to be a professional athlete and helping me develop the tools I needed to make it in this sport. I started working with him in October 2005. He told me early on that what it would take to get some results was “going to bed very, very tired, and waking up very tired every single day for three years.” That describes life with Brett’s training pretty well. I often woke up feeling like I’d been hit by a truck, and learned quickly that there was nothing to do but get moving and get over it—because “easy” days were very few and far between. When we began our project, neither Brett nor I imagined that three years of that kind of work would result in an Ironman title; almost three years to the day later, it did. JP: What is the best athletic advice you received? I can’t think of any particular quote here, but what I have benefitted from throughout my athletic career is training with champions and learning by example. When I was a swimmer at the University of Southern California, I had teammates who were Olympic gold medalists and world record holders. Then as part of Brett Sutton’s squad, I had the privilege of training with many great Ironman Champions. I’ve always thrived on being the proverbial small fish in a big pond, as I have learned so much about being a professional and what it takes to be a champion from these training partners. HB: What advice would you give to an age grouper regarding Ironman training? A lot of people want to make training a whole lot more complicated than it needs to be. No gadget or fancy equipment is going to make you a champion. To a great extent, what improvement comes down to is simply saying “yes” to the alarm clock every morning-- getting the work done, day in and day out. There is no magic bullet. CONSISTENT hard work is the key. JP: Thanks so much for taking the time to talk with us. Last question, why do you race with a pearl necklace? HB: Actually it is a silver Tiffany star necklace. It was a gift from my parents and I love it! If I took it on and off for each ironman, it would have been lost years ago!